Most fashion plates don't show the front of the dress, so it's hard to tell what the neckline would have been. Plus I'm not sufficiently versed in the vagaries of day/afternoon/visiting/dinner types of dresses, so as to not make a horrible faux pas. I prefer square and sweetheart necklines and faux vest fronts like the TV405 vest basque, but would that type of neckline be totally wrong for this dress? Is there a rule on neckline styles (I know that off-the-shoulder/short sleeve = ballgown, but that's about it)? What kind of dress is the one in the plate, and what neckline is suitable? 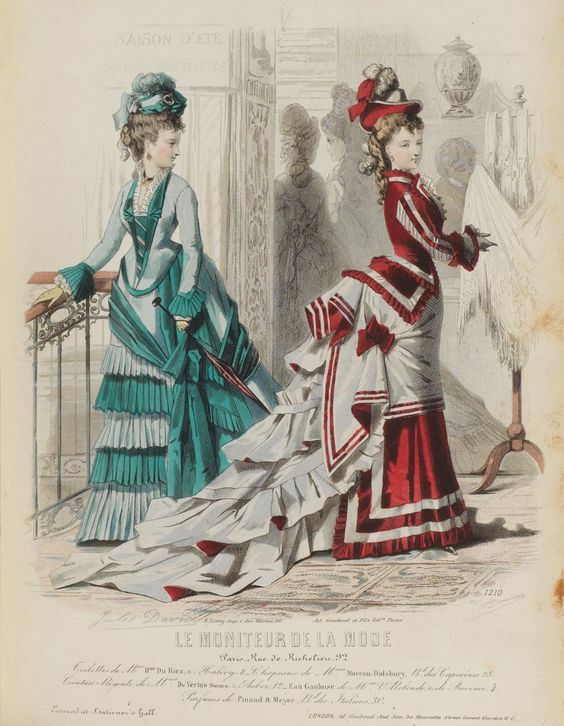 I'd assume from the setting that it's some sort of day or visiting dress, but the long train seems impractical for walking about, and I've noticed that sometimes they show two types of dress in one plate regardless of setting. Re: Neckline options for 1875? It most likely has a neckline similar to the one on the right, which is a "V". At least that's what the collar bit I can see looks like. That V Neck, called En Ceur meaning heart shape, was hugely popular for daytime wear or formal afternoon wear. In the 1870s, they were just beginning the "many dresses to get you through the day" thing, and 3 dresses would be all you needed. The first would be a morning dress that you could do chores in or run errands before lunch. After lunch, you want to change into your afternoon dress, which actually could be your morning dress with some bits of laced added to it (lace collar/cuffs or a fichu). This dress would be worn for visiting or at home. Then you changed for dinner, and a nice evening gown would work well. Before 1880s, they were more lenient about open neckline for daytime. Morning wear would most likely have linen collar and cuffs filling in the neckline (or one made of the bodice fabric to make it look high necked), which could be changed out for lace for afternoon or omitted for evening. Evening styles can have a square neckline for dinner, or a ball neckline for evening parties. The square neck can have short puff sleeves or a elbow length fitted sleeve. And the ball neckline always has short puff sleeves. The fabric choice was also a large part of when it is appropriate to wear. Wool for daytime, silk for evening. Serviceable colors for morning like browns or blues, with brighter choices for afternoon wear. There really is whole litany of "rules" they followed, and really we have no idea what they were. This was a period of the rise of the Neuvaux Riche, and the upper classes kept the rules secret so that the New Money could be spotted and shunned from across the room. My favorite example of this was a fashion article from the 1860s where the writer spent about 6 long winded paragraphs complaining about having seen a lady wearing a green dress with a yellow hat with feathers on it riding in a carriage one afternoon. Not one mention of why this was bad, just a whole lot of "can you believe it? How horrid it was." Seriously. So, all that said... both these dresses look like nice afternoon/visiting style. Trains where pretty much on every dress, so that doesn't help. The best thing to do is to know when you plan to wear the dress, and then design the neckline accordingly. I'm mostly just waffling because V-necks tend to not be very flattering on me (I have very narrow shoulders and wider hips) so I usually go with a squareish neckline in order to balance out my proportions. 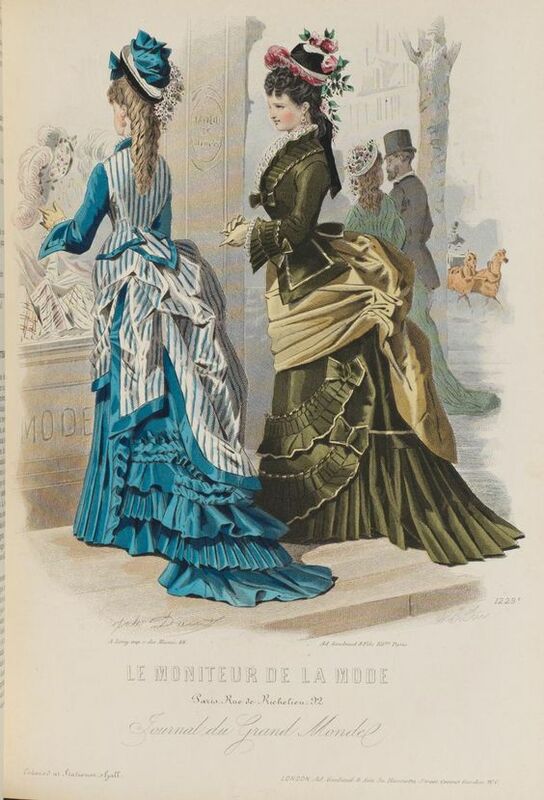 But I do like the look of the pleats and ruffles on the lady on the right. I guess I'll do some experiments with muslin and see what works on me. I'm making this for the Historical competition at Costume-Con so there's no specific time-of-day. How would the closure work on something like the one on the left, where there is no obvious centre opening? Would there be a hidden closure off-centre? Or elsewhere? The 1870's usually doesn't do hidden closures very often. I would guess that the closure is a hook/eye at the center front on the green dress. If is was the 1880s, then I would say that the closure would more likely be at the side front.